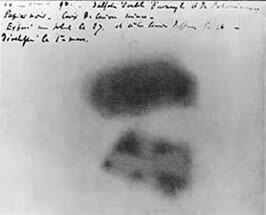 In 1896, Henri Bequerel was studying the fluorescent properties of uranium salts and placed a piece of the uranium salt on top of a photographic plate wrapped in black paper. He discovered, upon development, that the plate was exposed in the shape of the uranium sample. Bequerel had discovered radioactivity. The radiation emitted by the uranium shared certain properties with x-rays and light. Becquerel and two of his students, Marie and Pierre Curie, shared the 1903 Nobel Prize in Physics for their studies in spontaneous radiation. Further experiments by other scientists showed that when the beam from a radioactive ore was passed through a strong magnetic field, there were three kinds of radiation emitted. These rays were named alpha, beta, and gamma by Ernest Rutherford. Alpha radiation is a stream of positive particles composed of two protons and two neutrons (helium nuclei), beta radiation is a stream of particles with negative charges now known as electrons, and gamma radiation is part of the electromagnetic spectrum. Based on the evidence of experiments in the latter part of the 19th century, it became apparent that the atom was not a solid sphere, and was far more complex than originally thought by the early Greek philosophers and John Dalton. A new model of the atom would have to be developed to incorporate these new findings. ©2007 ABCTE. All rights reserved.